Interplay MAM is an asset management solution coming from Avid. The software consolidates all media and makes finding specific files deftly and expeditiously. With the solution’s integration with other Avid products like MediaCentral Platform, dispersed teams are able to access locally and cloud-stored media with ease. And with Interplay MAM’s modularity, businesses and organizations can customize the solution according to their requirements. This personalization allows creative teams to fully optimize the application and use it to its fullest capability. In addition, Avid’s MAM automates multifarious media tasks. This affords teams more energy to expend on creative undertakings rather than on media management. It saves them valuable resources, especially time, and reduces expenses for the company as well. Interplay MAM also provides a multitude of analytics and reporting capabilities. This way, organizations can truly keep track of their media and also pinpoint which assets are profitable and reusable. All in all, Avid’s digital media management solution does the heavy lifting for teams so they can focus on what matters most—creating engaging media. Interplay MAM’s system enables quick upload and download of media files and supports transfer of media between locations as well. With this function, creative teams are able to work on projects without delay and broadcast companies can show the right media at the right time. Pulling up a file from the cloud database is made easy by Interplay MAM. Its full integration with other Avid products allows it to search different locations, whether local or remote, to find the correct media. The solution further does this through its different parameters, allowing teams to input relevant data for a faster search. This way, teams do not have to spend precious production time in looking for what they need. Rather, they can spend more time creating media. Interplay MAM does not just store media files in the cloud for teams to access anytime. It converts media to the most optimum format for different screens and devices, including social media platforms for a wider reach. As a web-based service, Interplay MAM provides access to media stored in different locations to all team members, whether they are on-site or working remotely. They can do this through a single, shared interface wherein they can follow, monitor, and manage media. Furthermore, users can tap into the cloud database using different devices, affording them more mobility while working. Interplay MAM’s common interface brings together members of the production and creative teams for a seamless collaboration on projects. The solution provides them with a shared online workstation so they can access assets and work on projects in real time regardless of their location and time zone. With this asset management solution, administrators and supervisors can design workflows for their teams that would automate complicated tasks. This opens up more opportunities for members to focus on their creative assignments and builds up efficiency for the entire team. Interplay MAM’s structure allows it to link with other Avid products, as well as with third-party programs. The open API further enables customization with broad SDKs and developer programs. As a production team’s needs grows, the solution also expands to encompass integrated systems. If you are interested in Interplay MAM it could also be a good idea to analyze other subcategories of Best Digital Asset Management Software gathered in our database of SaaS software reviews. Since each organization has particular business requirements, it is prudent for them to abstain from seeking a one-size-fits-all ideal software application. Needless to say, it would be pointless to try to find such an app even among popular software platforms. The clever thing to do would be to list the various important factors that require consideration such as required features, budget, skill levels of workers, company size etc. Then, you should do your homework thoroughly. Read some Interplay MAM reviews and investigate each of the other solutions in your shortlist in detail. Such in-depth homework can ensure you discard ill-fitting applications and select the solution that provides all the elements you require for business success. How Much Does Interplay MAM Cost? We realize that when you make a decision to buy Digital Asset Management Software it’s important not only to see how experts evaluate it in their reviews, but also to find out if the real people and companies that buy it are actually satisfied with the product. That’s why we’ve created our behavior-based Customer Satisfaction Algorithm™ that gathers customer reviews, comments and Interplay MAM reviews across a wide range of social media sites. The data is then presented in an easy to digest form showing how many people had positive and negative experience with Interplay MAM. With that information at hand you should be equipped to make an informed buying decision that you won’t regret. What are Interplay MAM pricing details? What integrations are available for Interplay MAM? Interplay MAM integrates with other Avid products as well as with third-party programs like Adobe Premiere Pro CC. For comprehensive information regarding this feature, see the Avid support pages or contact support. 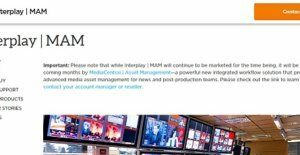 If you need more information about Interplay MAM or you simply have a question let us know what you need and we’ll forward your request directly to the vendor.